Thanks to the Internet, we can see and talk to friends and family around the world! Hosting a video chat is one of the easiest ways to get a group “together” – sans travel time and expense. 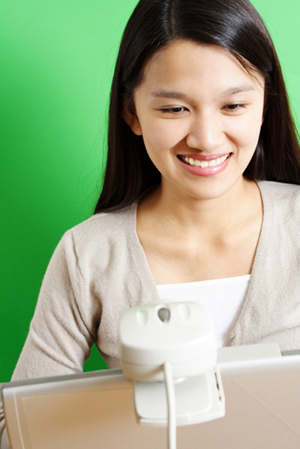 Here is a brief checklist of what you need – and what you need to know – to host a video chat. Do some research on web chat sites before you get started to ensure you are signed up with the one that suits your needs. Some are free and some have costs associated, so be sure to do your homework and understand the terms before you sign up. Also, if you want to talk to several people at once, make sure you go with a provider who offers that ability. If you obtain an account with a web chat host, you may not need to purchase any software programs for your computer since much of the software is on the Internet. Same goes for the other parties in your “chat.” However, some companies have software associated with their program that you’ll need to download before proceeding. Also, if your computer is not equipped with a webcam, you will need to download the software that comes with the webcam you purchase. Once you are signed up, and your friends and family are too, it’s a simple matter of following the site’s instructions to initiate the chat. (For example, with Skype, it’s as easy as finding the person you want to speak to in your contact list, clicking on the name, then clicking the video button. Easy. www.skype.com. To ensure uninterrupted, high-quality video chats, you may need to upgrade. Some web chat sites, such as webcamnow.com offer limited free service but charge a fee for upgrades such as HQ video, 50x faster speeds, larger sizes, and private messaging. You also would benefit from purchasing an optimized high-quality video webcam to ensure the best video quality. Logitech QuickCam Pro 9000 is a great one for PCs. Apple fanatics will like Logitech QuickCam Vision Pro for Mac. To maintain an uninterrupted video chat, a dual core processor PC and a fast broadband connection will make all the difference in the world.